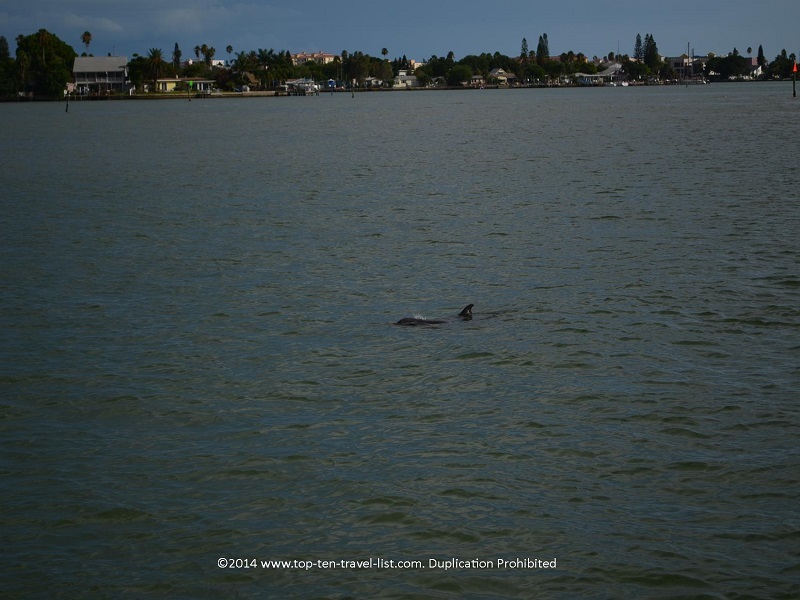 Dolphin Watching in Madeira Beach, Florida - Top Ten Travel Blog | Our experiences traveling throughout the US. 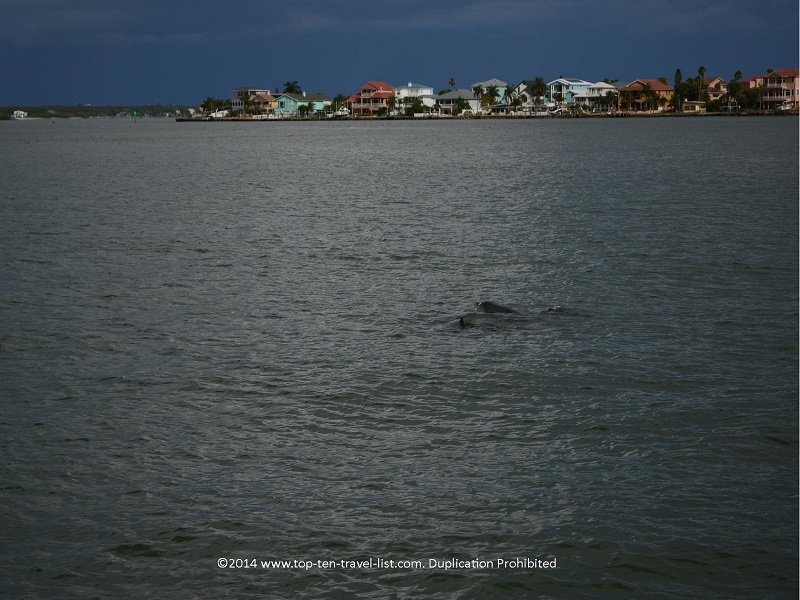 A trip to Florida’s Gulf Coast would not be complete without catching a glimpse of a few dolphins. 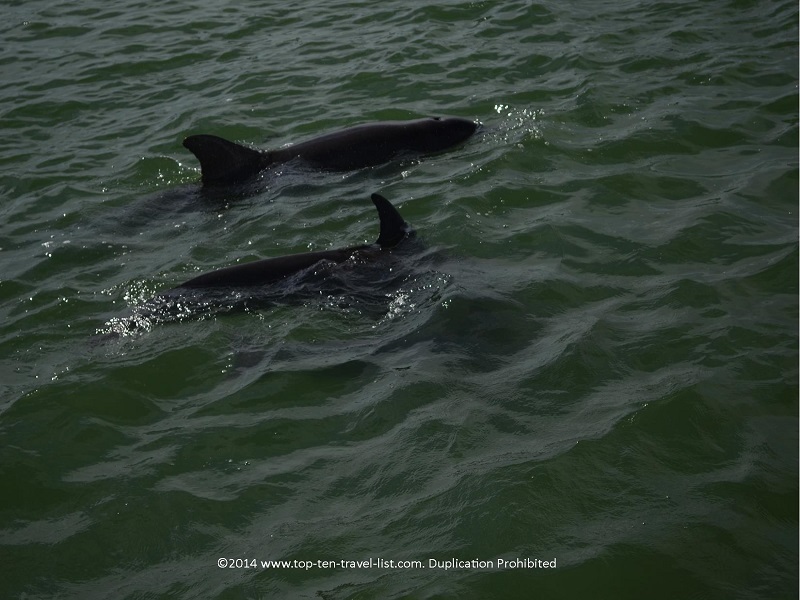 Taking a cruise is your best option for viewing these beautiful mammals up close. 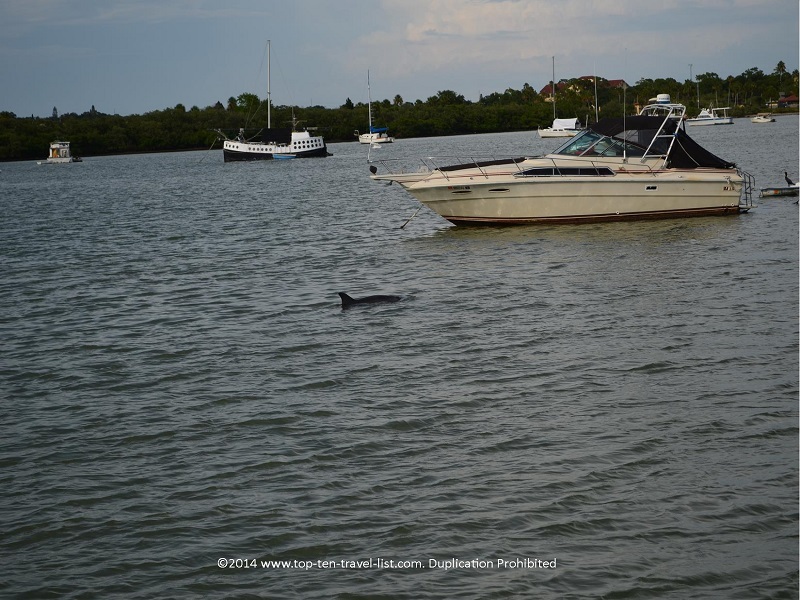 Hubbard’s Marina, located on John’s Pass in beautiful Madeira Beach, is the perfect place for your first dolphin cruise. 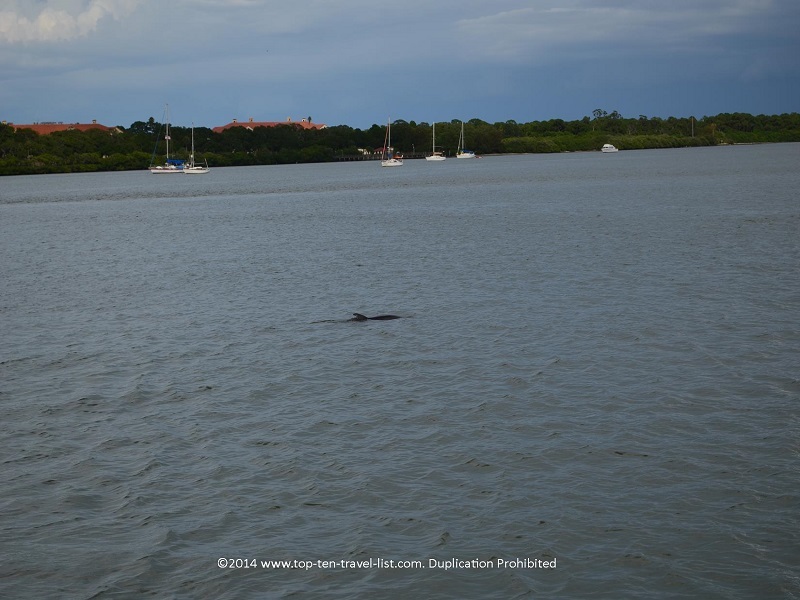 Laid-back, friendly hour and a half cruises are offered daily year round. 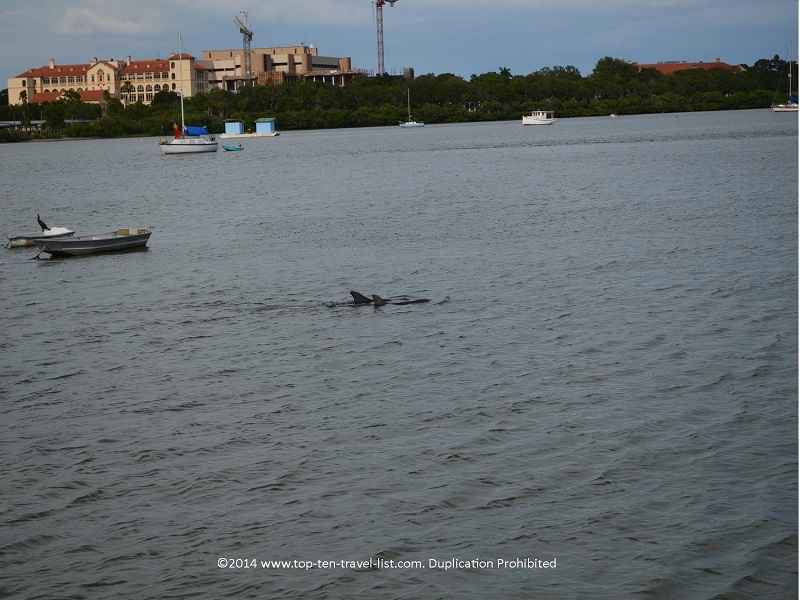 The chance to view wildlife in their natural habitat is a much different experience than viewing them at a zoo. 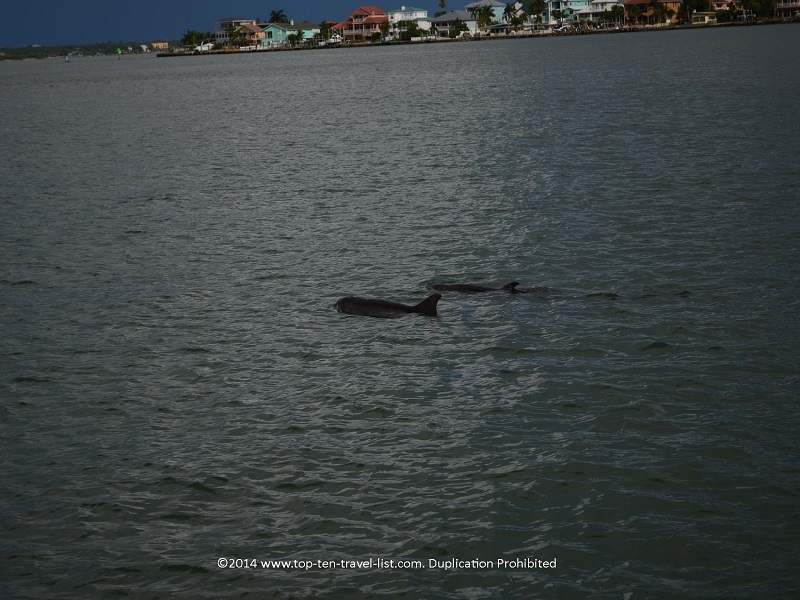 All of the dolphins in the pictures are Atlantic Bottlenose Dolphins. 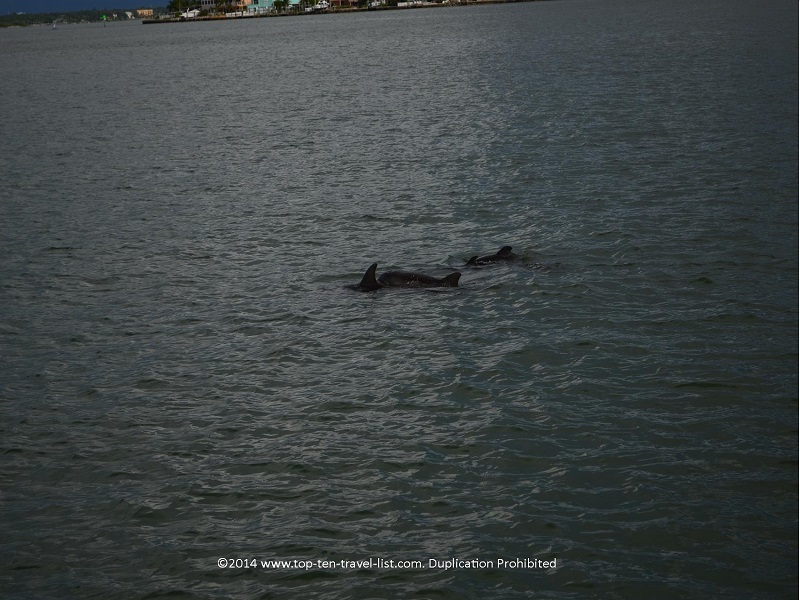 The dolphins are very fast, so it was difficult to get quality pictures. 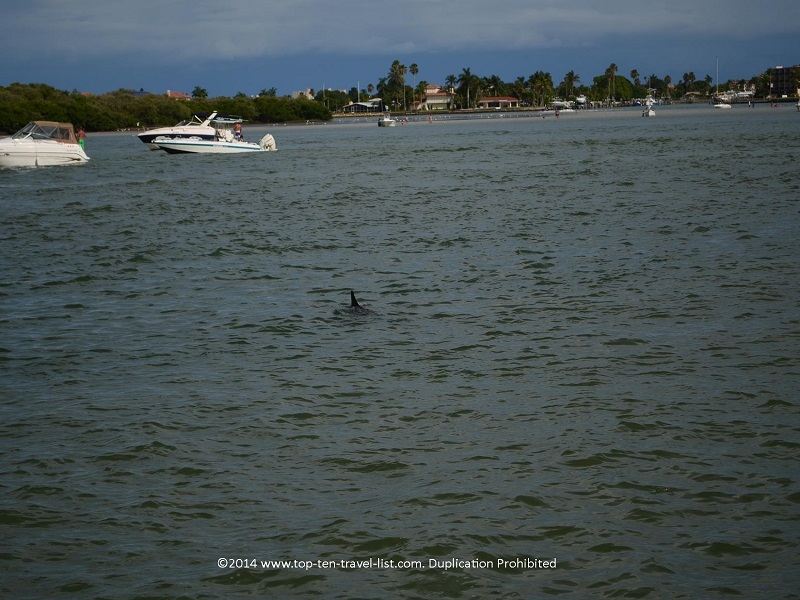 Also, the dolphins never jumped out of the water, hence, the majority of the time we were only able to get a quick glimpse of a fin. 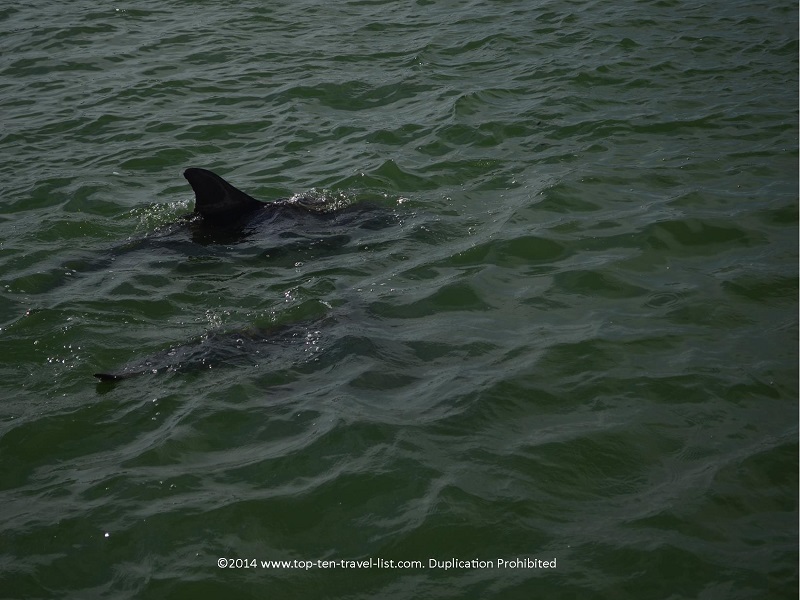 Plenty of dolphin fin sightings along the way! 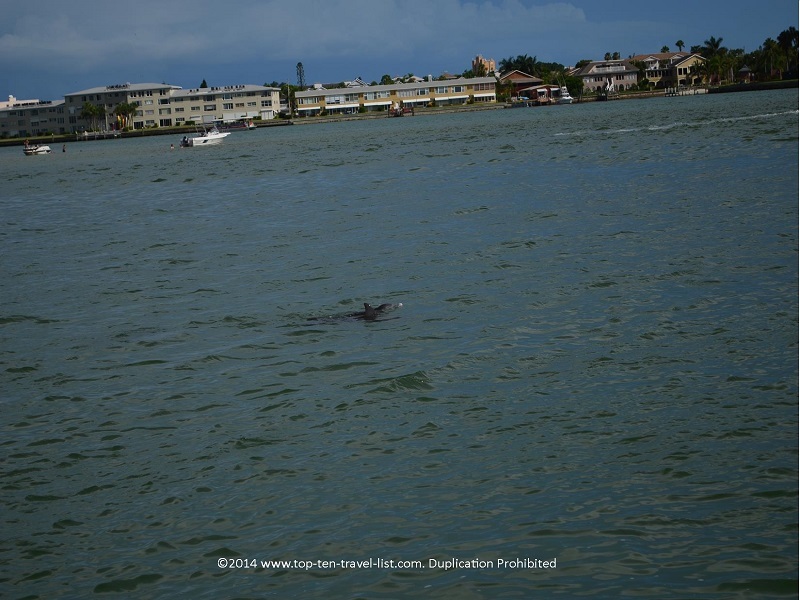 As you can see, the dolphin is out of the water a bit more in this picture. 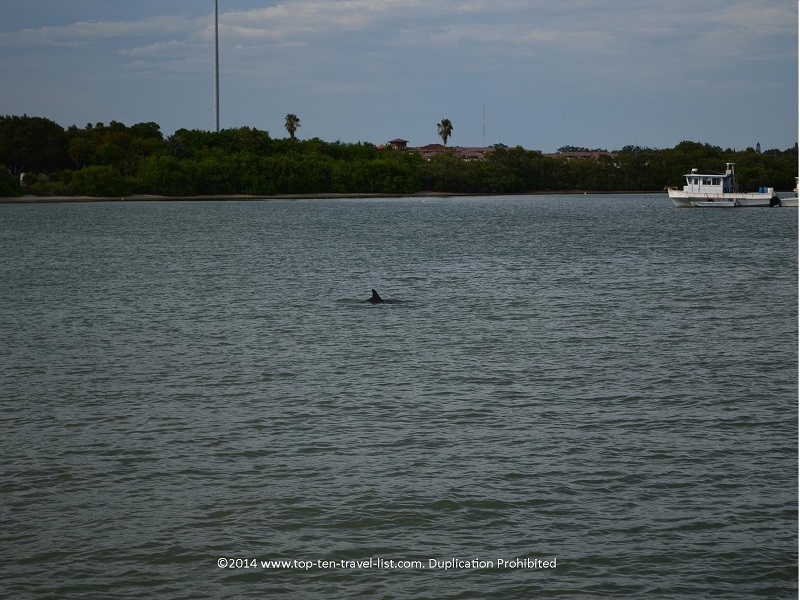 This is one of the rare instances where we could see a bit of the dolphin’s face. 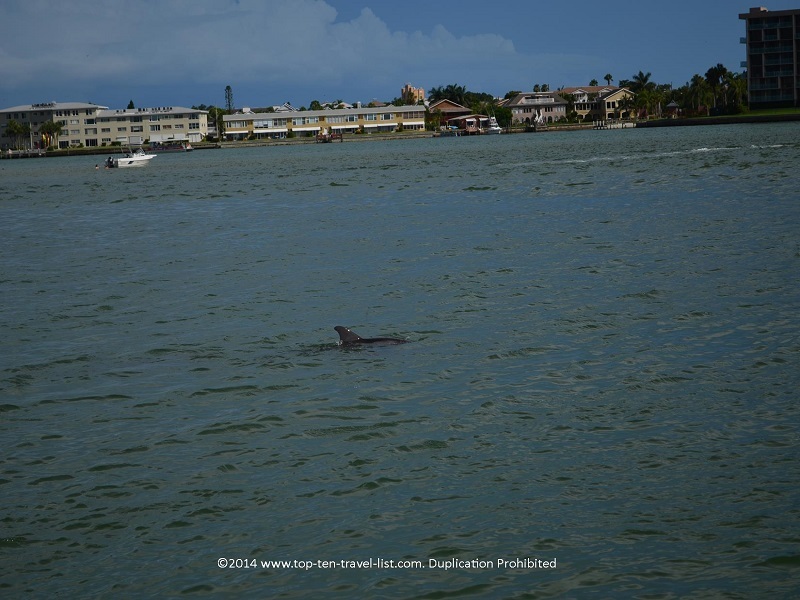 Staff is well-trained in the best places to find dolphins. 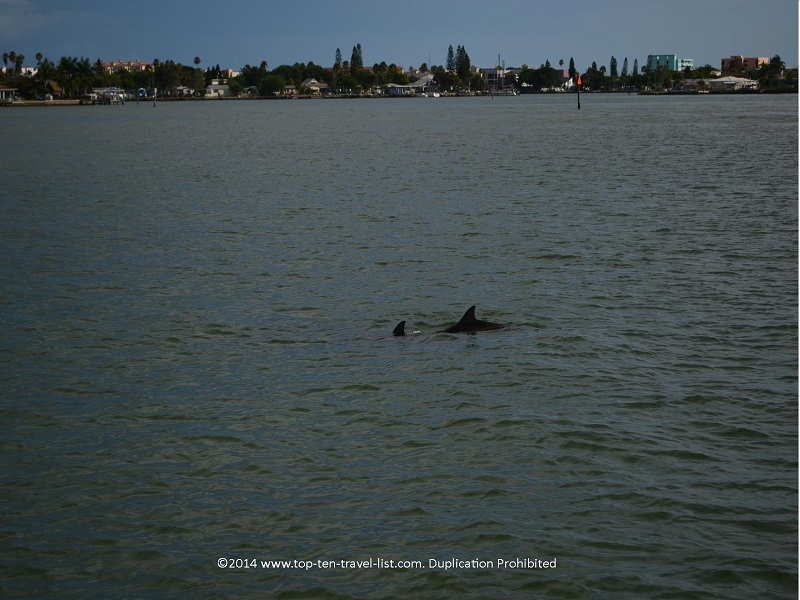 They will alert you right away to the first sign of a dolphin. 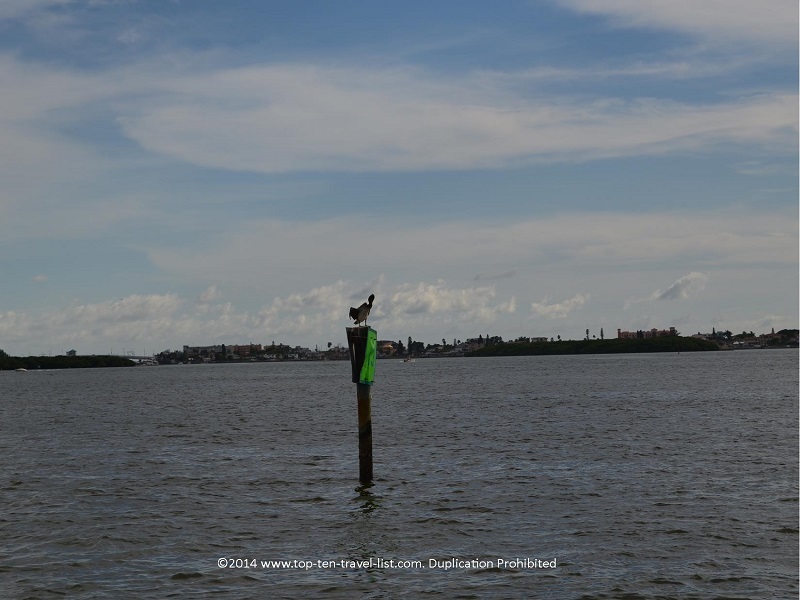 Plus anyone on the boat will point one out as soon as they are discovered. This gives you plenty of time to get out of your seat and get your camera ready! You do not have to worry about leaving unhappy as sightings are guaranteed! I was surprised by the number of sightings. To be quite honest, I would have been happy to have seen just one. 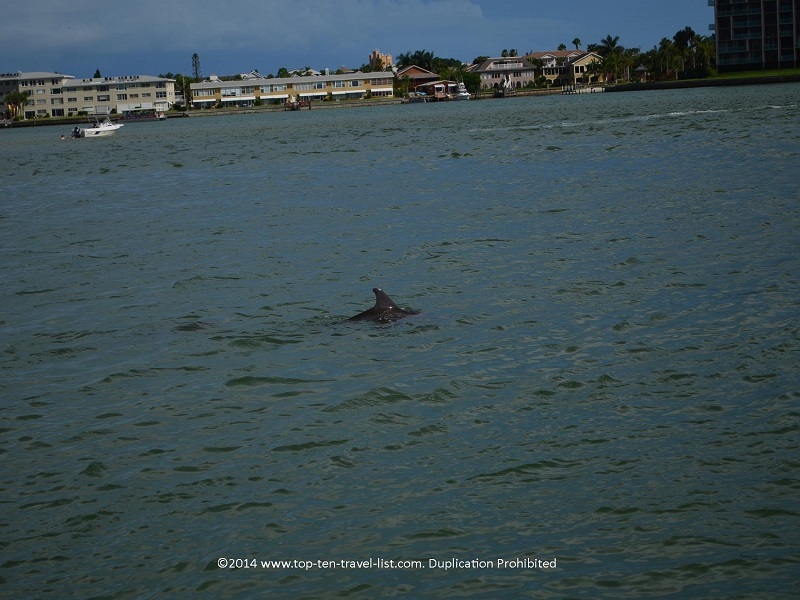 We were lucky enough to see several groups of dolphins swimming along. 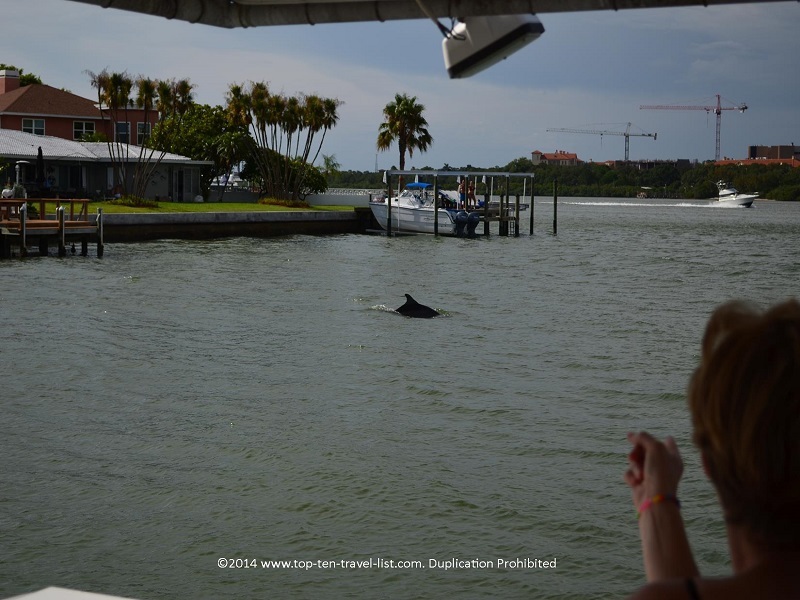 On 2 occasions, we were able to get really nice up-close views! 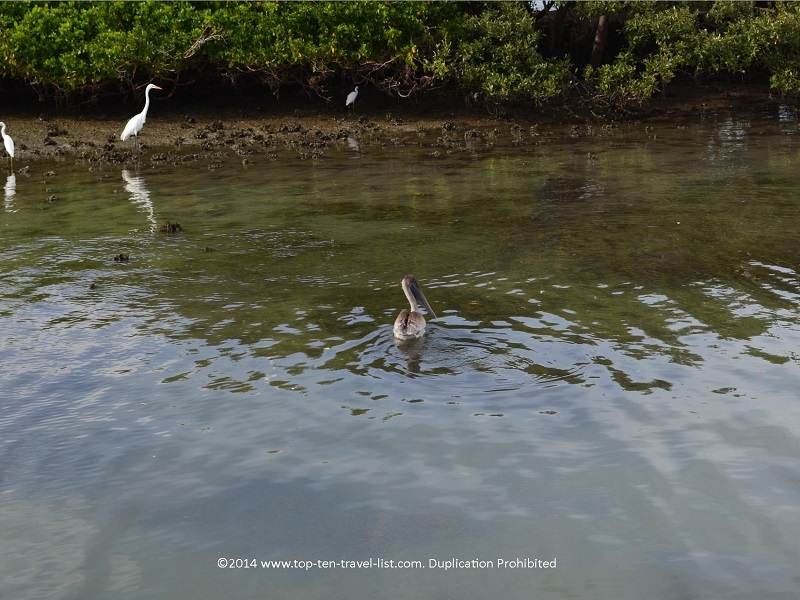 Not only did we see plenty of dolphins, we also came across dozens of snowy egrets and pelicans. 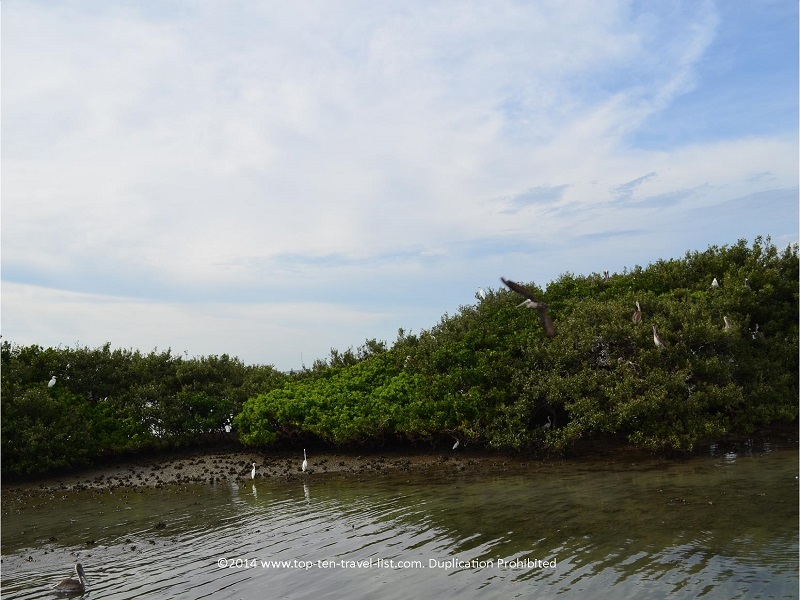 My favorite part of the cruise was the journey around Dogleg Key Bird Sanctuary, a beautiful mangrove island. 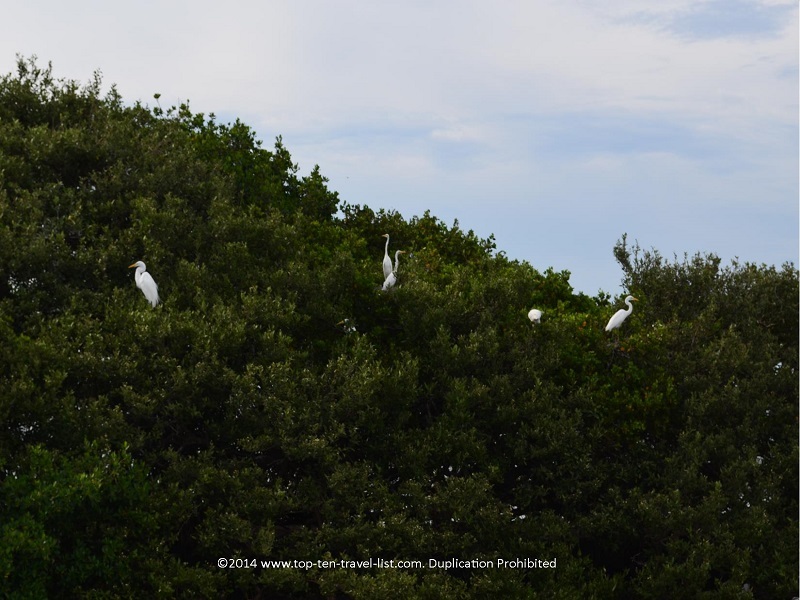 As you can see in the photos below, beautiful pelicans and snowy egrets populate the island. 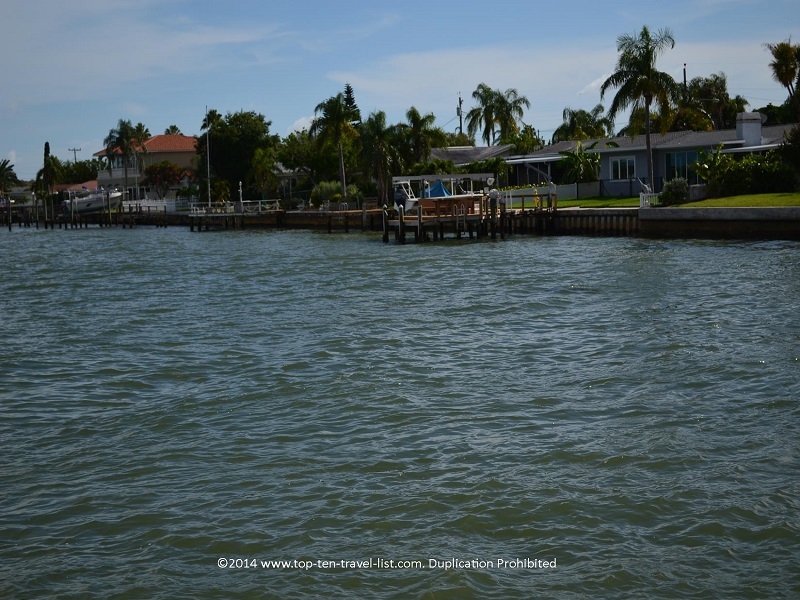 Along the way, you are treated to gorgeous views of parks, islands, and mult-million dollar waterfront homes. The small admission ticket is worth it for the cruise alone. 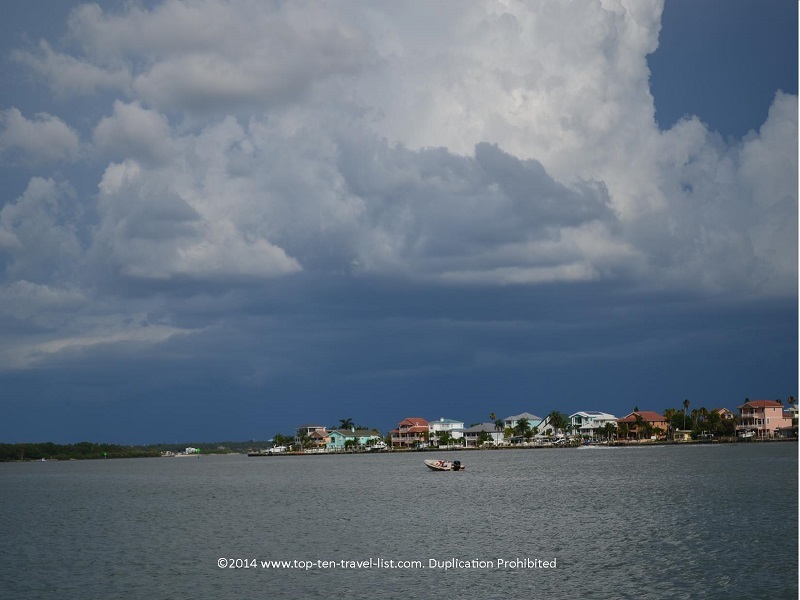 A cruise is a great way to enjoy the day in Florida without suffering in the sun. 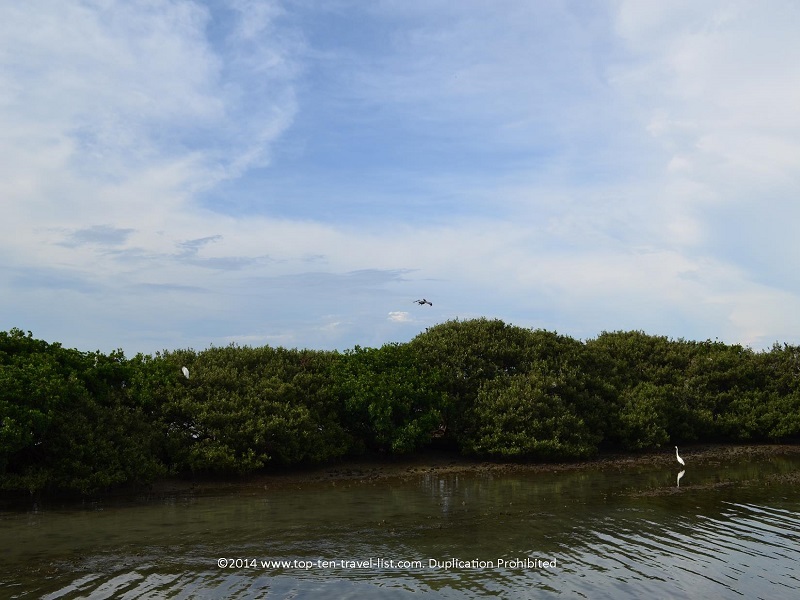 Although it was a hot day, the temps began to cool down as soon as we started moving and the breeze made the cruise much more comfortable. The boat is covered so you do not have to worry about the sun beating down on you the entire ride. 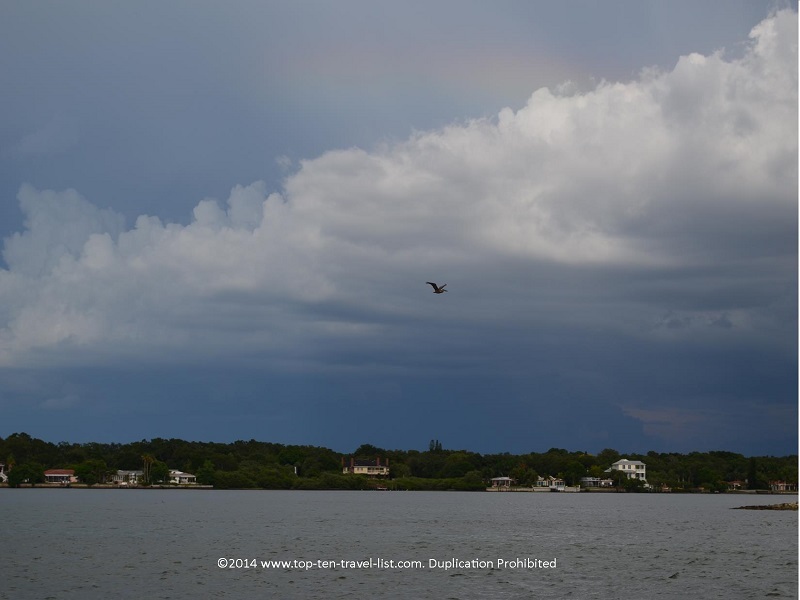 We picked a great day for the cruise as there were only a handful of other passengers on board. 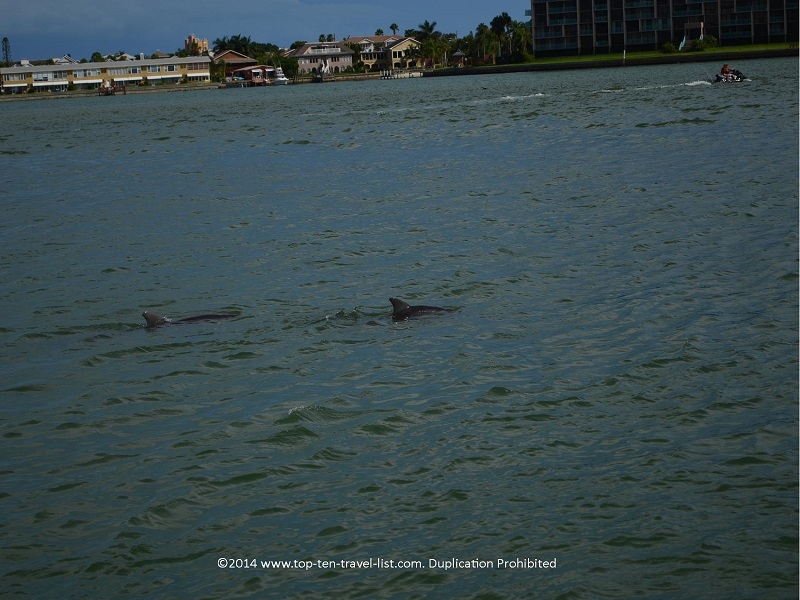 This made it really easy to get up out of our seats to view the dolphins. 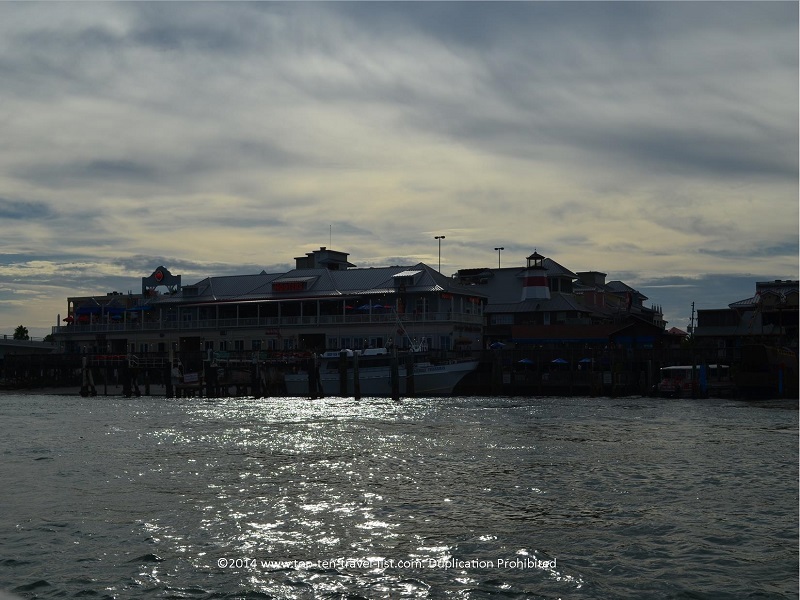 I enjoyed this cruise over others due to the casual, relaxed atmosphere. 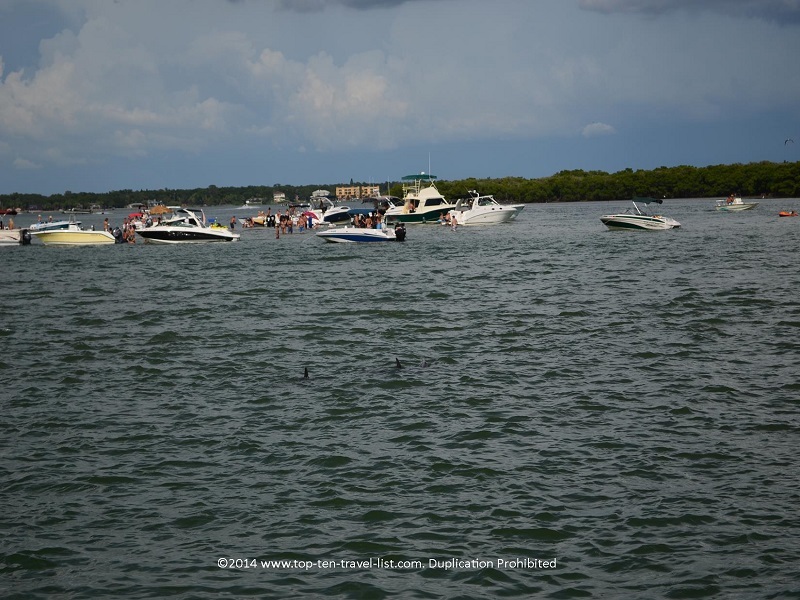 Overall, Hubbard’s Marina Dolphin Cruise was a great opportunity to simultaneously enjoy the sunny Florida weather while observing wildlife in their natural habitat. Beer, wine, bottled water, and a small selection of snacks are available for purchase. *They can live up to 50 years. *They are both docile and agile. *Males tend to roam alone. 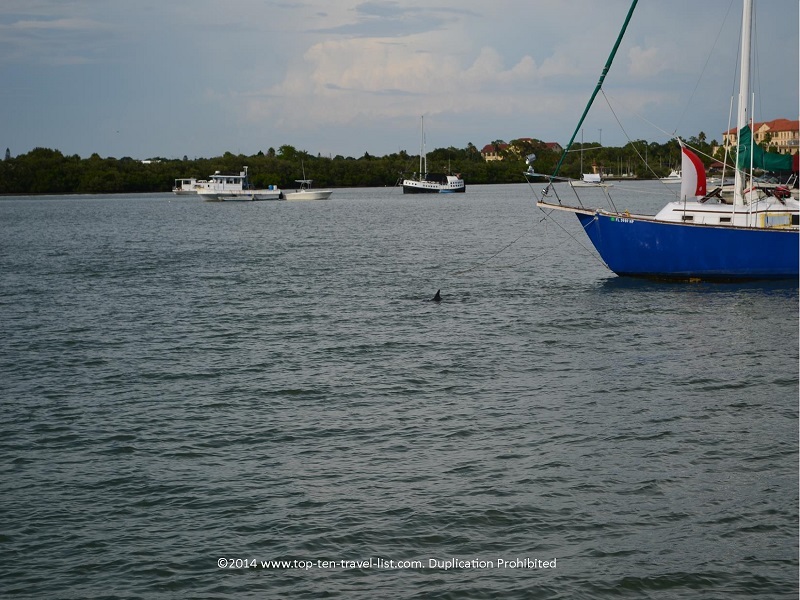 *There is a $25,000 fee for feeding or bothering a dolphin. 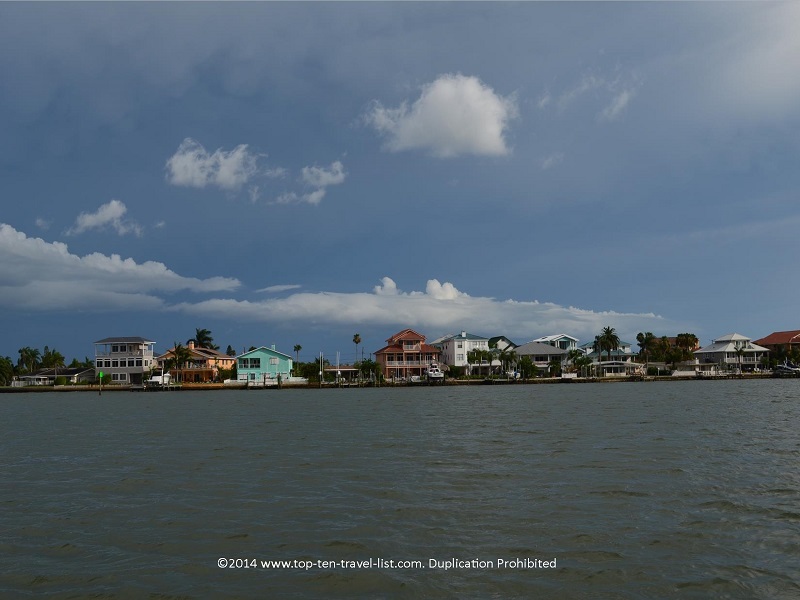 Be sure to take a walk around John’s Pass Village and Boardwalk. 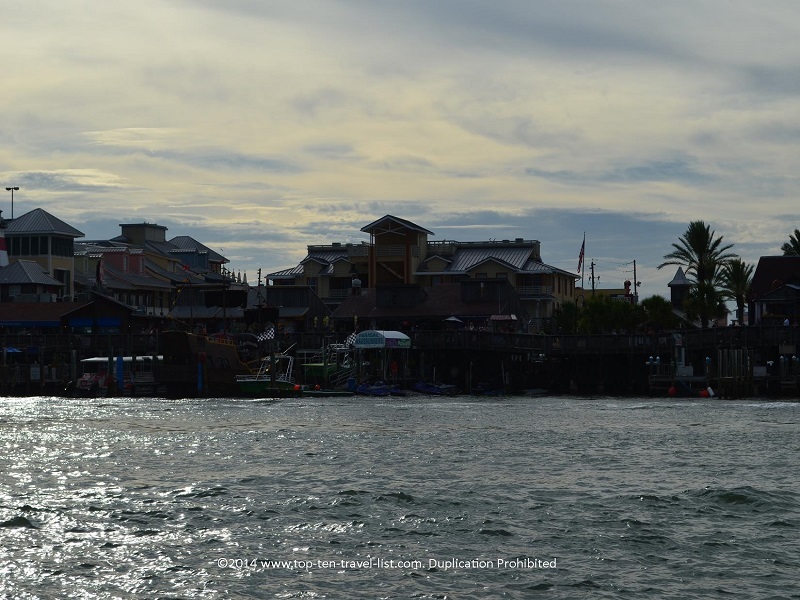 This area is just beautiful – one of the best tourist shopping/dining destinations I have encountered in the area thus far. 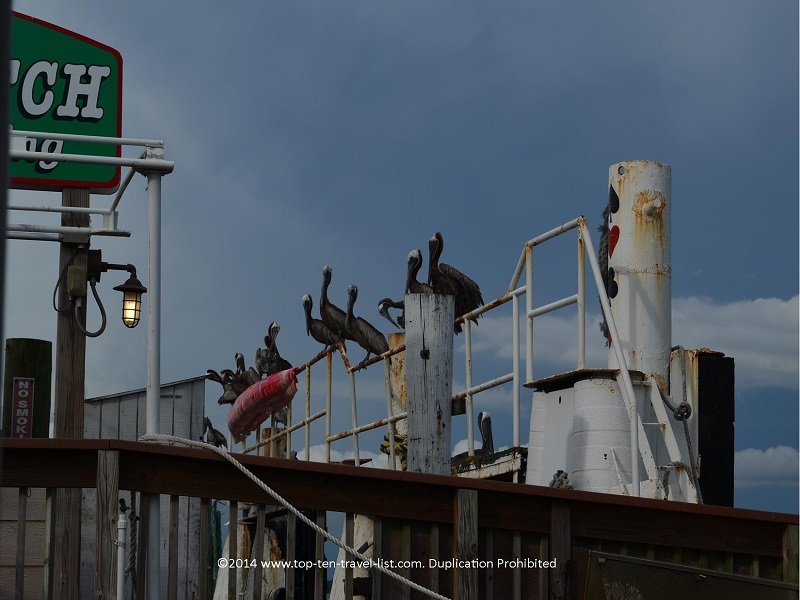 There are plenty of interesting shops, places to pick up souvenirs, a handful of waterfront restaurants (from casual chains like Bubba Gump Shrimp and Hooters to local choices like Scully’s), and of course gorgeous views! 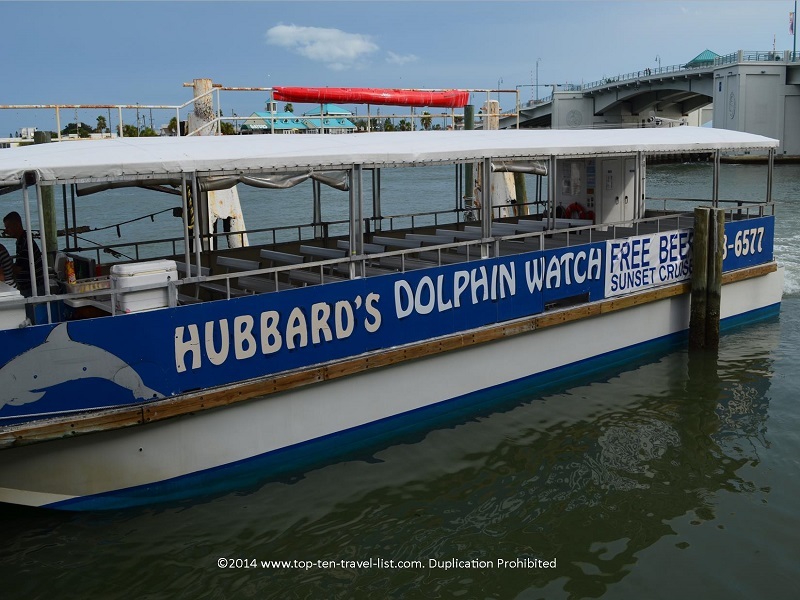 In addition to the Dolphin Cruise, Hubbard’s Bay also offers sunset cruises. 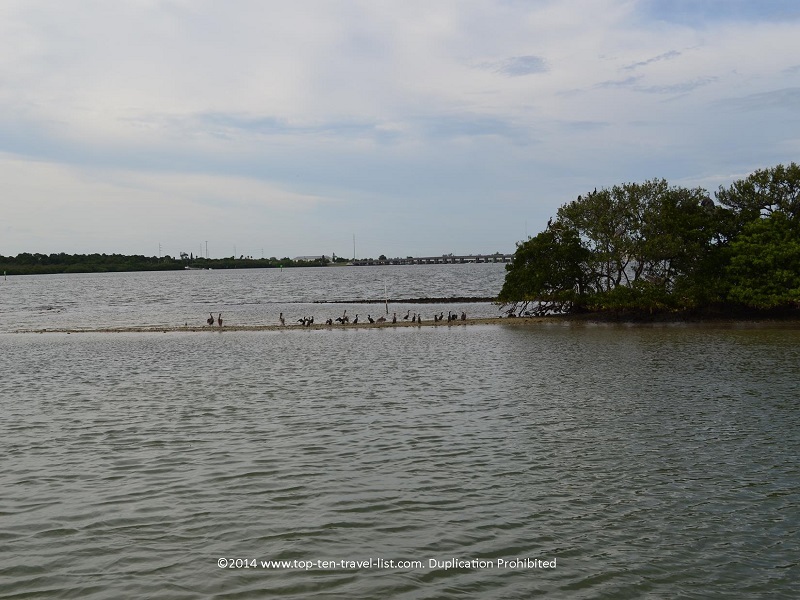 Take a walk over to Madeira Beach, located right next to John’s Pass. 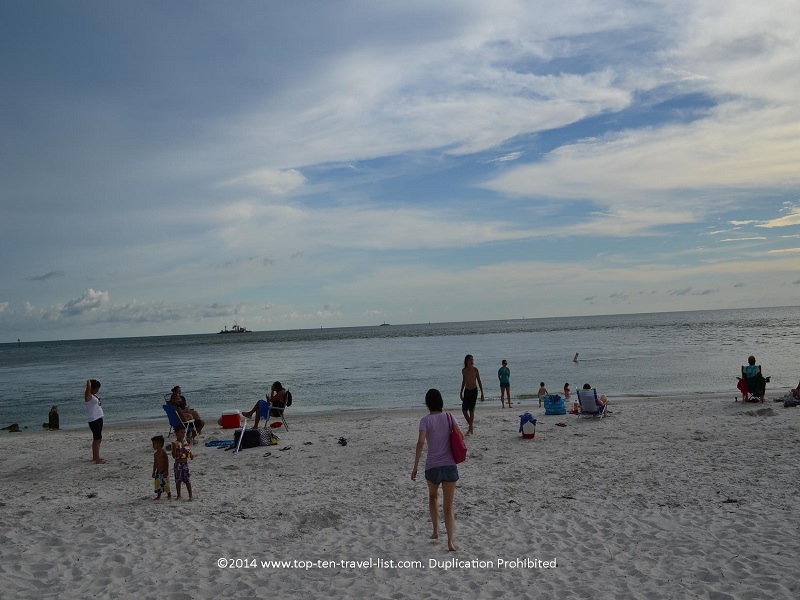 This great little beach is clean and well-maintained. Smooth white sand and clear, warm water. Not too many crowds around even on a Saturday afternoon. 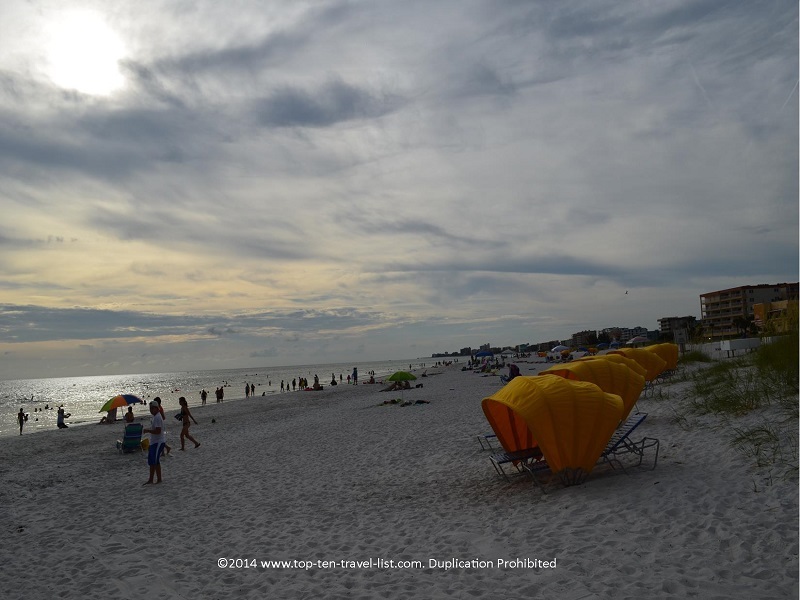 The beach was peaceful and much less noisy than others in the area. Great place to relax! 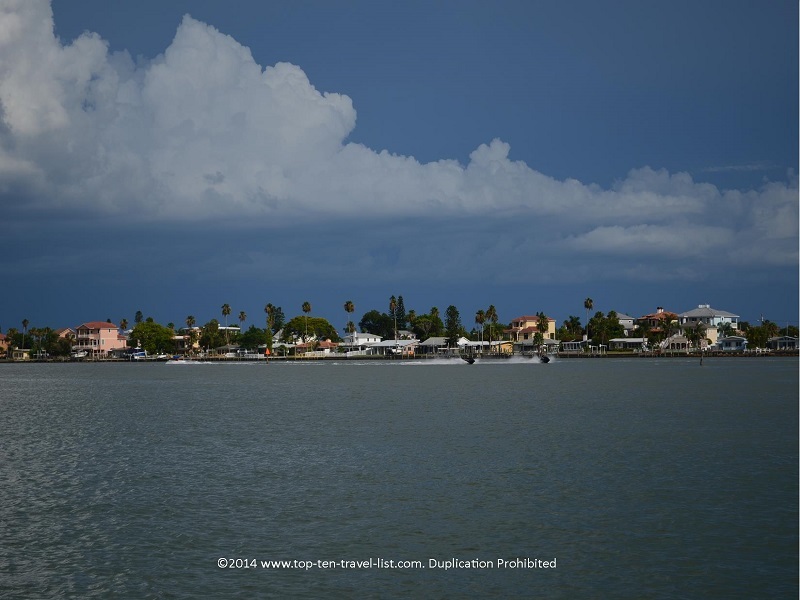 Plenty of restaurants and shops on John’s Pass after your day spent on the beach. Parking: There is a large parking lot which only charges $1 per 30 minutes (daily max is $20). We happily drove right into the garage as opposed to circling around finding parking meters at most other beaches. Prices: Adult tickets are $20.86. Children 11 and under are 49.70. Under 11 is free. 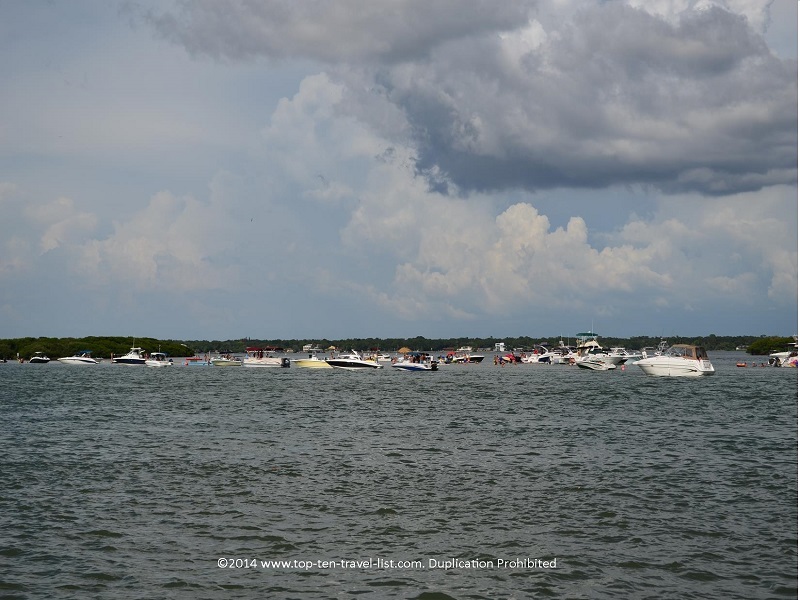 Cruise departure times: 11am, 1pm, 3pm & 5pm (spring and summer), 1pm &3pm (fall and winter). To make a reservation: Call (727) 393-1947. *Bring with a camera, preferably one with a high shutter speed. 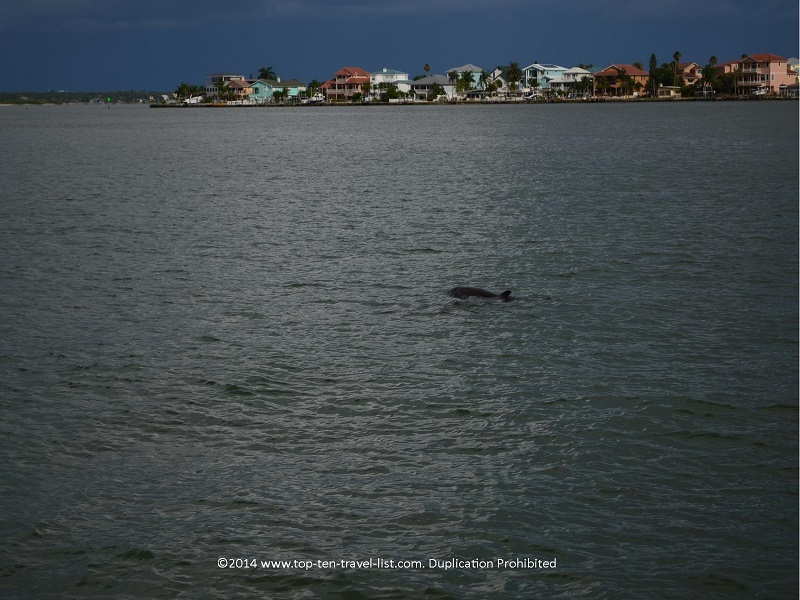 There are plenty of beautiful pictures to take, not only of the dolphins, but also beautiful landscapes. *Sign up for the Hubbard’s Marina email club for discounts and a free pint glass.